You can back up your files either by saving them to external media or by using Mountain Lion’s awesome Time Machine feature. The simplest method of backing up files is simply to copy the files and folders to an external hard drive, a USB flash drive, a CD, or a DVD. Nothing fancy, but it works. Select the desired files and folders that you want to back up from your internal drive. Drag the selected files to the external drive window. Load a blank disc into your MacBook’s optical drive. If you’re using the default settings in the CDs & DVDs pane in System Preferences, a dialog asks you for a disc name. Drag the files and folders that you want to back up into the disc’s Finder window. They can be organized any way you like. Don’t forget that the total amount of data shouldn’t exceed 700MB on a CD. You should also stick within 4GB or so (on a standard recordable DVD) or 8GB (on a dual-layer recordable DVD). You can see how much free space remains on the disc at the bottom of the disc’s Finder window. Click File, and then choose Burn Disc from the menu. You can also click the Burn button on the Recordable DVD bar — it appears at the top of the disc’s Finder window. Choose the fastest recording speed possible. If you enable backups via Mountain Lion’s Time Machine feature, you can literally move backward through the contents of your MacBook’s hard drive, selecting and restoring all sorts of data. Files and folders are ridiculously easy to restore, no matter what the operating system or backup program. Time Machine can even handle such deleted items as Contacts cards or photos you sent to the Trash from iPhoto! Because Time Machine should be an important and integral part of every Mac owner’s existence, the Time Machine icon is included in the Dock. Apple’s Time Capsule device is designed as a wireless storage drive for your Time Machine backup files. If you’re interested in a single Time Machine backup location for multiple Macs across your wireless network, Time Capsule is a great addition. Note that the Time Capsule drive isn’t meant to be mobile, so while you’re on the road, you still need an external USB, Thunderbolt, or FireWire drive. Before you can use Time Machine, it must be enabled in the Time Machine pane in System Preferences. From a Finder window, open the folder that contained the file you want to restore. Click the Time Machine icon in the Dock (which bears a rather funky clock with a counterclockwise arrow). The oh-so-ultra-cool Time Machine background appears behind your folder, complete with its own set of buttons at the bottom of the screen. 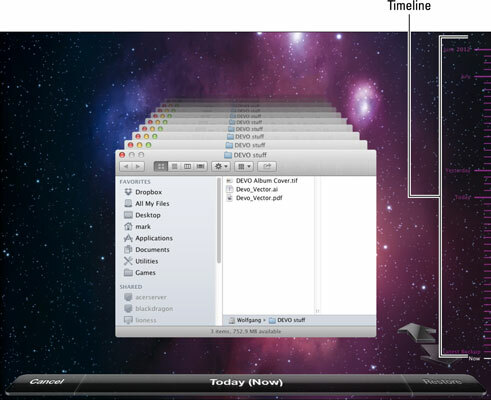 On the right, you see a timeline that corresponds to the different days and months included in the backups that Mountain Lion has made. Click within the timeline to jump directly to a date (displaying the folder’s contents on that date). The backup date of the items you’re viewing appears in the button bar at the bottom of the screen. After you locate the file you want to restore, click it to select it. Click the Restore button at the right side of the Time Machine button bar. If you want to restore all the contents of the folder, click the Restore All button instead. Time Machine returns you to the Finder, with the newly restored file now appearing in the folder. Out-standing! To restore specific data from your contacts or images from iPhoto, launch the desired application first and then launch Time Machine. Instead of riffling through a Finder window, you can move through time in the application window. For robust backup and restore protection, Time Machine has everything that a typical Mac owner at home is likely to ever need.